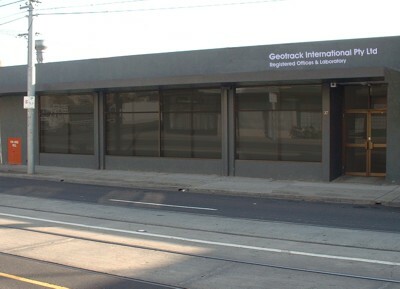 The Laboratory facilities at Geotrack International have been designed and constructed to Geotrack's specifications and meet the rigorous Australian Standards for safety and work environment. The laboratories comply with all local and state legislations and operate efficiently with qualified, highly trained staff in all departments. The role of the facilities is primarily to produce the necessary data for Apatite Fission Track Analysis (AFTA), but they also provide a range of analytical and electron and optical microscope services to the mineral exploration industry and a wide variety of other users. We demand a very high technical standard of ourselves and are pleased to adapt our procedures to the precise requirements of our clients. This area is equipped with a single toggle jaw crusher and disc pulverizer for crushing and grinding, and a Wilfley table for preliminary heavy mineral separation as well as sample washing facilities and low temperature drying ovens. This laboratory operates with two Frantz isodynamic magnetic separators and four fume cupboards to carry out heavy liquid mineral separations and acid etching requirements. 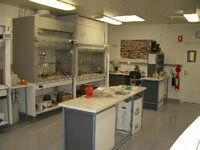 This laboratory is also equipped with mineral grinding and polishing facilities and optical microscopes. A computer in this area enables sample information to be entered directly into the Geotrack database. In this laboratory, we operate a JEOL electron microprobe X-ray analyser and a scanning electron microscope. The microprobe receives x-y location files from the automated stage systems on the Zeiss microscopes, which enables rapid and accurate re-location of the areas to be analysed for composition. The scanning electron microscope is equipped with an X-ray analyser to allow qualitative analysis of areas being viewed and a digital image capture sytem that enables images to be stored on disk, printed or taken away for later printing and inclusion in reports. Geotrack staff have over 20 years experience with the operation and identification of materials and minerals using an energy dispersive X-ray detector on the electron microscope. If you need further information on any of these services just contact us with your query and we will be pleased to carry out a comprehensive assessment of your needs to meet your deadlines.